Interesting data! The treatments do differentiate from each other with higher rates leaching more nitrate. My question is "What was the previous N management"? Is the low N addition rate being influenced by residual fertilizer N from the previous crop? Response to William Horwath: The field was winter fallowed prior to the trial. The soil at the site has 2.1% organic matter and may have mineralized the sizable quantities of nitrate observed early in the crop cycle. I'm not so clear on what the last line of this excellent presentation means. By saying that "monitoring of the concentration of nitrate in the leachate may not be a consistently useful tool", do you mean that the numbers tend to bounce around too much? It does seem though at the lower application rates there is a trend downwards over time- I am assuming this is because the plant is larger and more able to pick up more N as the season progresses. Thanks for putting this out. Mark: The comment refers to the fact that the RWQCB has proposed to monitor nitrate concentration in leachate as a measn of measuring nitrate leaching from agricultural fields and has set the drinking water standard of 10 ppm nitrate-nitrogen as the upper limit. The data in this trial would suggest that concentration may not be a reliable way to measure nitrate leaching because even the control treatment had nitrate leaching levels that exceeded the drinking water standard during a large part of the growing cycle. 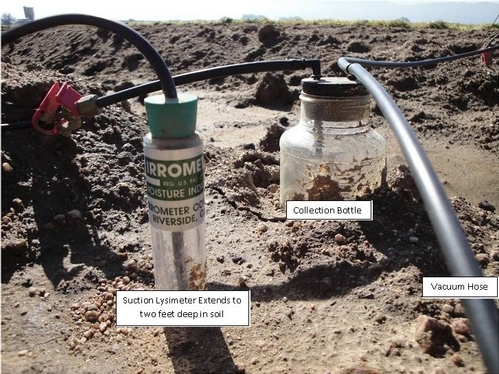 We are just beginning to increase our understanding of nitrate leaching through the use of lysimeters. 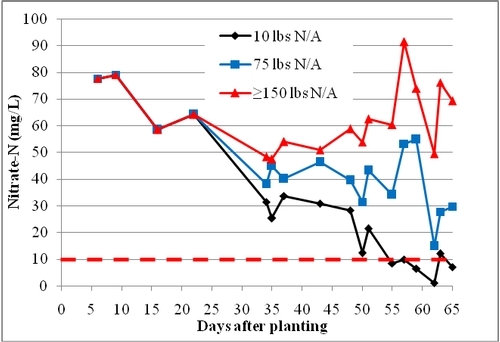 It may be that it is premature to set limits for nitrate in leachate based on concentration and that focusing on load of applied nitrogen may be simpler and more accurate approach.